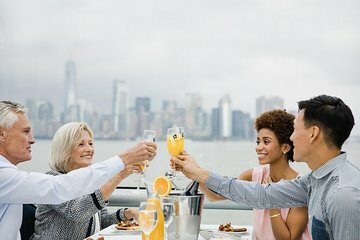 If your feet are tired from walking the New York streets every day in search of sights to see, this easygoing brunch cruise is the perfect antidote. Spend Easter morning sailing around New York Harbor, cruising past the Hudson River, the Brooklyn Bridge, Ellis Island and the Statue of Liberty. Take photos of the Manhattan skyline from the water or just sit back and enjoy the brunch buffet on board. Check in at the West Village's Pier 40 then sip the first mimosa of the day as the crew escorts you to your seats. Relax on deck with views of the Hudson River: first head north to spot the Empire State Building, then turn south towards the New York Harbor, where you'll have views of the Statue of Liberty and Ellis Island. Shortly after you leave the pier, a buffet brunch will be served. Keep your camera ready as you pass Governor’s Island, and continue along the East River, sailing below the Brooklyn Bridge and Manhattan Bridge. The captain follows the same route on the return journey, and throughout the cruise, you’ll have access to endless mimosas, coffee, and tea (with plenty of time to dance to the music). This 2-hour Easter cruise concludes at the original departure point.